Extended exposure to mineral oil hydraulics fluids has, in rare cases, caused weakness in the hands and arms. Some people may have an allergic reaction if their skin comes into contact with certain hydraulic fluids. Of course, common sense tells us we shouldn't drink hydraulic fluid or put it in our eyes. The type of hydraulic fluid used with construction equipment isn't dangerous for most people until it is pressurized. A stream of hydraulic fluid under as little as 100 psi of pressure can penetrate your skin. This type of injury is called hydraulic fluid injection. 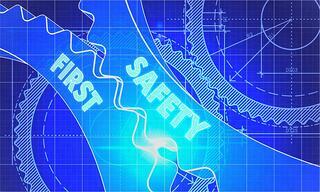 The first recorded case of a high pressure injection injury was back in 1925. Note that such injuries don't just occur with hydraulic fluid; they can involve grease, diesel, paint, and even water. Most people who have experienced hydraulic fluid injection claim that it initially feels somewhat like a bee sting or a wire prick. The entry site may be so tiny that it looks like a pin prick -- but major damage can occur. Other wounds might be larger and look like cuts or tears in the skin. Within a few hours people report pain, swelling, and redness. Numbness and throbbing rapidly follow, and after six hours you will know you've been seriously injured. Untreated, hydraulic fluid can result in compartment syndrome, necrotic tissues, amputations, and even death. 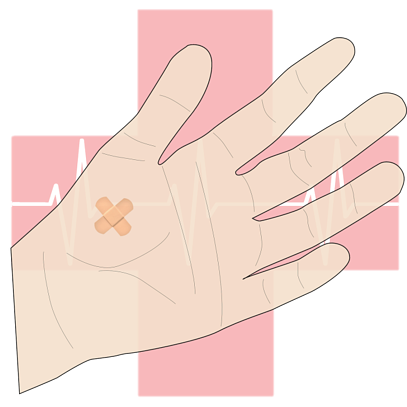 Do not use your hand to locate a leak if you want to avoid an injection injury. Many technicians will run their hand over a hose that is suspected of a leak, and if they can't find one they may ramp up the pressure until they do. This is not a safe practice. There are other ways to locate hydraulics, such as using a piece of cardboard in place of your hand. Don't expose you hand or arm to potential leaks. Loosening or tightening lines that are under pressure can also cause injection injury. An especially unsafe practice is opening lines to bleed air from cylinders. Any time high pressure lines are going to be disconnected, the pressure needs to be bled from the system. There are also gloves that can minimize the effects of hydraulic fluid injection. Injection injuries don't always cause problems immediately. If you have come into contact with pressurized hydraulic fluid, see a doctor right away. It may not look like a problem, but hydraulic fluid contains chemicals that are toxic to the human body and will kill human tissue. Keep in mind that emergency surgery may be required to save as much tissue as possible after an injection injury. If you work around construction equipment, you run the risk of hydraulic fluid injection. The best way to avoid injection injuries is to be careful around potential leaks and depressurize high pressure lines before working with them. An injection injury may feel a bit like an electric shock and only leave a tiny pinhole. However, you risk losing your hand, arm, and even your life it you don't get it treated right away.